GMK3060L ... based on its predecessor’s design but has a longer boom. 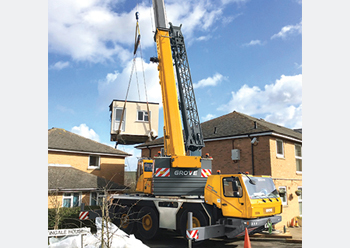 Manitowoc Cranes will launch an upgrade of the three-axle Grove GMK3060 all-terrain crane at bauma 2019, the world’s leading construction machinery fair to be held from April 8 to 14 in Munich, Germany. The new GMK3060L is based on its predecessor’s design but has a longer boom (48 m instead of 43 m) and is said to offer the strongest taxi load charts in its class. Like the original, the GMK3060L features the most compact dimensions in the three-axle segment, enabling it to access tight job sites, manoeuvre easily around city centres, and even work indoors, according to Andreas Cremer, Manitowoc’s global product director. The chassis is almost as compact as a two-axle model and up to 1 m shorter than competitive three-axle cranes, with a carrier length of only 8.68 m and a minimum overall height of 3.48 m with the suspension fully lowered, he adds. The new model features a longer, 48-m seven-section Twin-Lock hydraulic pinned main boom and boasts significantly stronger load charts. He says the GMK3060L was developed in accordance with The Manitowoc Way and is a result of Voice of the Customer feedback, a methodology whereby cranes are built in accordance with customers’ needs and wants. The GMK3060L is powered by a Cummins QSL9, a 254-kW (340 hp) six-cylinder in-line diesel engine for reduced fuel consumption. “The QSL9 combines high strength with a compact footprint for one of the best power-to-weight ratios in its class, and will be available in both Tier 3/Euromot III and Tier 4 Final/Euromot V variants to cater for all markets. The crane will include a ZF TraXon automatic transmission, giving it 12 forward-speed options and two reverse,” he concludes. Founded in 1902, Manitowoc is a leading global manufacturer of cranes and lifting solutions with manufacturing, distribution, and service facilities in 20 countries. In 2017, Manitowoc’s net sales totalled $1.6 billion, with over half generated outside the US.